I always get excited about the Advent season and I think that part of the reason is because of the great opportunity we have, this time of year, to embody the Kingdom of God. I heard Stanley Hauerwas say that church (and the Church) should be like a foreign country and that when we enter it's doors it should "frighten" us. The contrast between the world and the Church can be so powerfully huge during the Advent season (not least in our use of the word "advent" which has less to do with Santa Clause and more to do with the coming of something big--the Olam Habah--a new kind of world which we can embody and embrace here and now). While the world is "Christmas shopping" we can be engaging in community and shared life. While the world is putting up Christmas lights, we can be responding to the need of our community as the world's true light. As they sing Christmas carols, we can worship in hopeful anticipation of the day when "Chains shall he break, for the slave is our brother and in His name all oppression shall cease." Through radical compassion, fueled by ridiculous celebration of the coming King, we can embody for the world somethings so far beyond the malls, the lights, and all the noise which distracts from the beauty of this season. And we can offer this alternative to the world as the bursting anticipation of Advent bursts within us with excitement and unadulterated hope. As much as embodying pertains to displaying and showing and as much as our alternative celebration of Advent involves being salt and light (or could if we allowed it), I think possibly the deepest alternative celebration of Advent has to happen inside of us. If we do not find within ourselves something different, something special--a renewed anticipation for and sincere faith in the Christ who comes to lift up the lowly--we cannot expect any alternative we could offer to be worth getting up on a Sunday for, let alone living for. The Advent, indeed the God, we offer to the world must be offered not just in deed but in word, and I'm not just talking about words we speak but the word that is inside of us as we live and move in the hope of this season. It is a word we must speak but we will never be able to grasp it with language. It's not just about doing different things, although that is obviously important, given what our culture does this time of year, but it's about where those things come from. What gave Mary the ability to say, "His mercy extends to those who fear him, from generation to generation" was not just the fact that she lived differently; it was because she was pregnant with the Word of God. The anticipation of a new day was so real inside her that she could speak of salvation as a present reality--"He has brought down rulers from their thrones but has lifted up the humble"--so embodying it and offering it to the world didn't even need to be talked about, it was just happening. 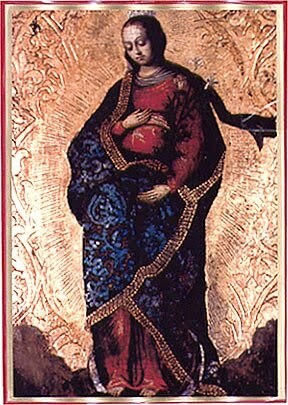 As Mary was pregnant with Jesus, may we be pregnant with the Word of God so that it wells inside us and gives us such real anticipation and exhilaration that we cannot help but let it burst forth from us making salvation, through our hands and our hearts, a present reality so that the world cannot help but tremble at the thought of a new kind of world. Let the words of those great Advent hymns stir inside you a renewed hope and a real sense that something big is happening. As you worship with word, song, and deed may your worship put your feet to dancing and send you spinning as you enter the world as a resident of God's dominion. Let your heart pound with the knowledge that "at the name of Jesus every knee should bow, in heaven and on earth and under the earth" (Philippians 2:10).